If your little piggy wants to go to market – or anywhere else for that matter – there’s no reason it shouldn’t, says our vet Jürgen. Guinea pigs can make excellent travel companions, but, as with any pet, there are a few must-dos to bear in mind when travelling with them, as these tips will remind you. If you still have any questions after reading this, Jürgen or another member of our friendly team at Edgewood Vets will be happy to talk to you when you contact us. Get your guinea pig a small carrier, but not one made of mesh, and introduce it as part of their daily routine. If you leave the carrier in their run they can eat and play in it ahead of the journey. Your guinea pig may be reluctant to eat while it’s on the road, so make sure you feed it a decent amount of fresh greens before leaving home. This will also help to keep it hydrated and possibly help it to nod off during the trip. If you’re travelling by car, it’s best to put the carrier in the footwell so it is stabilised. Make sure there’s a water bottle whatever the length of the trip, and avoid putting heavy bowls in the carrier as they could get bumped around and harm your pet. Be weather-aware and don’t travel in extremes of temperature. If you can’t avoid warmth then a cold or frozen water bottle wrapped in a towel will help, as will big pieces of cucumber – there’s a reason they’re referred to as cool. If it’s colder, extra hay and some fleece will help provide warmth. If you’re travelling by rail or bus, your guinea pig will be reassured by your voice if you encounter any disturbances along the way. Always make regular checks on your pet and its food and water situation when travelling. 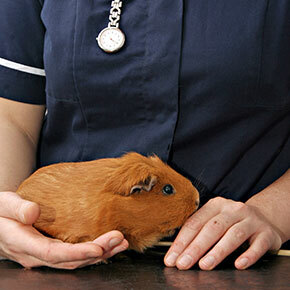 If you follow these simple rules there’s no reason you and your guinea pig can’t enjoy many happy travels, but don’t hesitate to call us on 01621 828381 if you’ve any concerns about how to journey with your pet or want to book a check-up before you head off.